Jude Law appears as Albus Dumbledore in the first teaser of Fantastic Beasts And The Crimes Of Grindelwald . Excited much? The first teaser of the second Fantastic Beasts film, titledFantastic Beasts And The Crimes Of Grindelwald is out. Yes, Eddie Redmayne as Newt Scamander will be back with some new adventures and some new (as the title suggests) fantastic beasts. The teaser will surely add to the weekend happiness of any Harry Potter series fan but here's a damper - the film will release one year from now. Sorry folks, you'll have to wait to watch the first ever onscreen Grindelwald and Dumbledore face-off. 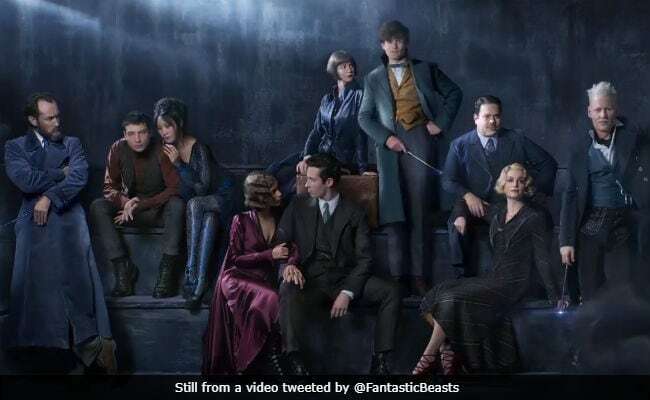 The teaser shows the principal characters of the second film and you'll be happy to know that 'no-maj' (muggle for British) Jacob Kowalski (played by Dan Fogler) returns to the film. But what will really make you happy is the presence of Jude Law as Albus Dumbledore (Yay! ), who stands in a corner, avoiding his friend-turned-foe Gellert Grindelwald, played by Johnny Depp. In addition, we are also introduced to Newt Scamander's elder brother Theseus (actor Callum Turner), an auror, who is engaged to Leta Lestrange (actress Zoe Kravitz), who was Newt's former love interest. Credence, who apparently destroyed himself at the end of the first film, also returns - he's in the teaser seated with actress Claudia Kim, who plays the role of Maledictus. Also, Katherine Waterston and Alison Sudol will reprise their roles of the Goldstein sisters Tina and Queenie, who played an instrumental role in Newt Scamander's quest in the first film of the series. Johnny Depp appeared as Grindelwald briefly in 2016's Fantastic Beasts And Where To Find Them. He remained undercover (damn you, Polyjuice Potion) for most part of the film as Percival Graves (played by actor Colin Farrell). Fantastic Beasts And Where To Find Them is a five-part series. The second film will focus on Albus Dumbledore's days as the Transfiguration professor at Hogwarts School Of Witchcraft And Wizardry while another film will feature Dumbledore and Grindelwald's epic 1945 duel, which lasted for three hours. Fantastic Beasts And Where to Find Them was directed by David Yates, who also directed the last four Harry Potter films. David Yates will return as director for the sequel too.